2. Add the chicken cubes and saute for 15 minutes. 4. Heat the remaining 1 tblsp oil in a pan over medium heat. 5. Saute the green onions and garlic for 2 minutes. 6. Add the tomatoes, mushrooms, zucchini, 1 tblsp ginger root, red chilli flakes, salt, pepper powder and chicken cubes. 7. Cover and simmer over medium heat for 20 minutes. 9. Add the cooked pasta to the vegetables. 10. Add lemon juice and 1 tblsp ginger root. 11. Toss well and serve hot. 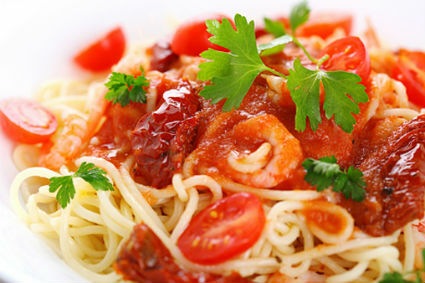 Feel free to comment or share your thoughts on this Ginger Tomato Chicken Pasta Recipe from Awesome Cuisine.